This article really should be called “Identifying Prodigal Great-Grandpa by Ancestor Mapping Your Chromosomes,” because that’s what we’re going to be doing. It’s fun to map your ancestors to your chromosomes, but there is also a purpose and benefit to be derived. So you can have guilt-free fun because you’re being productive too! Oh, and yes, you can work on finding Prodigal Great-Grandpa. The answer is that it’s not easy, but it is sometimes possible. Note the word sometimes. A good part of the definition of “sometimes” is how willing you are to do the requisite work and if you are lucky or not. Luck favors those who work hard. And let’s face it, you’ll never know if you don’t try. I mean, Prodigal Great-Grandpa is not going to text you from the other side with his name and date of birth. What we’re going to do is basically work through a process of elimination. The term for what we are going to do is called chromosome mapping your ancestors or more simply, chromosome mapping or ancestor mapping. In essence, you are going to map your own chromosomes based on which ancestor contributed that part of your DNA. I have simplified this process greatly in order to explain the concept in a way you can easily follow. I’m going to use my own pedigree chart as an example. We’ll pretend we don’t know the identity of Curtis Benjamin Lore. And yes, for those of you wondering, all of these people are deceased. I realize that you are going to have more than the 32 autosomal matches shown on my example spreadsheet. You’re also not going to be able to find common ancestry with many of your matches due to things like dead ends, incorrect ancestry, segments identical by state (IBS) or DNA that comes from older ancestors that is not recognizable today after name changes in many generations when descended through females. There are lots of reasons why you might not be able to find genealogy matches. It’s the other matches, the ones where you can decipher and determine your common ancestor that help a great deal, and that is where we’ll focus. These are the ones that matter and the keys to identifying Prodigal Great-Grandpa. In my example here, we live in a perfect world. We are looking to map the DNA of my 8 great-grandparents in order to figure out the identity of mother’s mother’s father. Of course, there is no Y-DNA to test in this instance, so we must rely on autosomal DNA. Ok, so maybe it’s not such a perfect world. In a perfect world, you’d be a male trying to find the identity of your father’s father’s father and you could test your own Y-DNA – but then we wouldn’t have a good story nor would we need autosomal DNA. And most people aren’t that fortunate. Three generations isn’t that far back – or four – if you count yourself as the first generation. If you’re quite lucky, you can test one or both of your parents, and maybe even a grandparent or great-aunt or uncle. Failing that, you should be able to find some cousins from your various lines to test. This entire exercise will be much MUCH easier for you if you can test multiple people descended from each of the 4 couples involved because you’ll be able to tell which lines your matches do, and don’t, match based on which cousins they also match. Take DNA test kits to family reunions! Obviously, you won’t be able to test anyone directly descended from your unknown great-grandfather, except perhaps his children. The more of his children you can test, either directly or through their children, if deceased, the better your chance of identifying your Prodigal Great-Grandfather because each child inherits some different DNA from their parents. In my case, we’re going to presume that there are no other known children, other than my grandmother. So how do we find Prodigal Great-Grandpa? First, download all of your matches with corresponding segment data from your testing vendor, either 23andMe or Family Tree DNA, into a spreadsheet. Ancestry does not allow you to do this, which is a significant drawback in terms of testing at Ancestry. You can do this today at 23andMe and at Family Tree DNA most easily by utilizing www.dnagedcom.com download software. You can also do this directly at Family Tree DNA on the Chromosome Browser page. Your spreadsheet will look something like this, but without the colors. That’s what you’ll be adding, along with the Common Ancestor column. Step 1 – Identify a common ancestor with those individuals you match on common DNA segments. This is really two steps, the common ancestor part, and the common DNA segment part. If these people are on your match list, we already know you have a common DNA segment over the vendor’s match threshold. The presumption here is that if you have 3 people that match on the same segment from the same ancestor, that’s a confirmed “yes” that this particular DNA segment is descended from that ancestor. You can also label these with only two confirmed descendants from the same ancestor, but I like to see three to be sure, especially if here is any doubt whatsoever that you’re dealing with the same ancestral family. For example, if you are dealing with 2 people who carry the same surname from the same location, but you can’t quite find the common ancestor – you’ll need 3 matches to identify this segment. In this case, I was able to test cousins so I know that on chromosome 1, Sue, Joe and John all match me on the same segment and they are all descended from Lazarus Estes. I know this because one of them descends from Lazarus Estes and his wife, Elizabeth Vannoy, but the other two, Joe and John descend from an Estes upstream of Lazarus, let’s say, his father, John Y. Estes, through another child, which allows me to positively identify this segment as coming not just from the couple, Lazarus Estes and Elizabeth Vannoy, but from Lazarus specifically. I’ve colored this segment mustard to represent Lazarus and so that you can visually see the difference between the 8 ancestors we’re working with. 2. Repeat the same process with your other matches, hopefully utilizing cousins, to identify DNA segments of your other ancestors. I’m only showing a very small subset of all of my DNA on my spreadsheet, and all matches are the exact same 10,000 cM blocks and only on one chromosome, for illustration purposes, but as you work through your matches, you’ll be able to color more and more of your DNA and assign it to different ancestral couples. Each of your chromosomes will have different colors as different parts of each chromosome come from different ancestors. Kitty Cooper released a tool to utilize AFTER you do this hard grunt-work part that paints a pretty picture of your ancestors mapped on to your various chromosomes. Here’s her example. Notice that each chromosome has 2 sides, Mom’s and Dad’s inheritance side. We’re going to use that to our advantage and it’s one facet of how we’re going to find Prodigal Great-Grandpa . In my case (not this example), I have several segments that I can’t identify to a particular couple, but I can assign it to a group. This is my Acadian group and is terribly admixed because of extensive intermarriage. I also have a “Mennonite” segment labeled in the same way for the same reason. So while I don’t know specifically who, I do know where and that helps a lot too. But in our perfect world in our example, we don’t have any of that. 3. Now that I have most of my genome colored in and assigned to ancestors, except for Prodigal Great-Grandpa, I can see where all new matches fall. Let’s say I get a new match on chromosome 1 in the segments between 10,000 and 20,000 and they also match Sue, Joe and John. Even if the new match is an adoptee and has no genealogy, I can tell them which line they descend from. And let me tell you, there is no greater gift. This is exactly how we told new cousin Loujean she descended from the Younger line. 4. 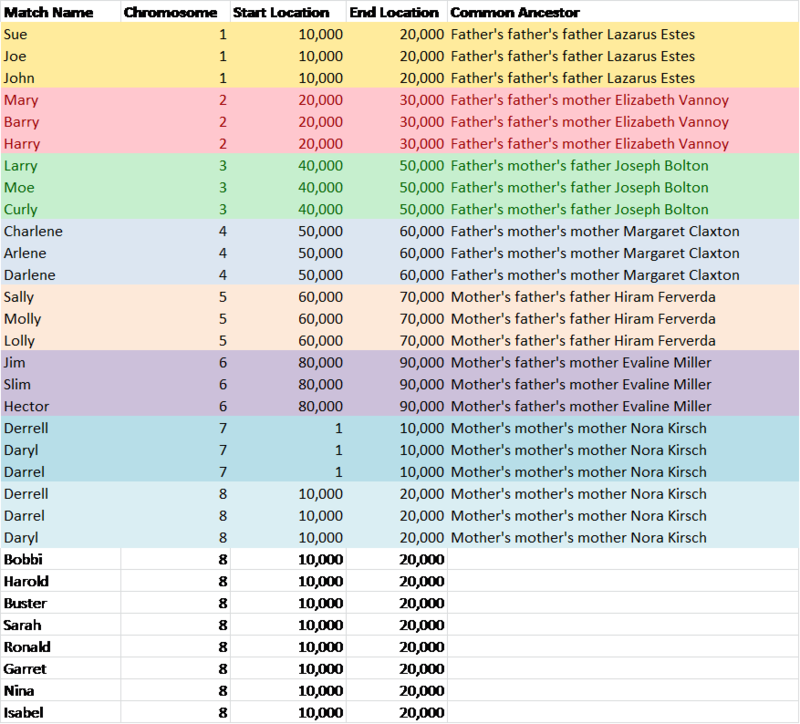 The only part of my match spreadsheet left uncolored, since this is a perfect world, would be the part that would probably come from my Prodigal Great-Grandfather. So let’s look at chromosome 8 and map it. The result is that now I have 8 matches that do match me, and based on other cousin matches, do descend from Great-Grandma/Great-Grandpa but don’t match the Derrell trio indicating Great-Grandma’s line. What this tells me is that the people who aren’t assigned, because they don’t match my cousins Derrell, Daryl and Darrel, or any other distant groups, must then be from Prodigal Great-Grandpa’s side or are “problem matches.” Problem matches are those that are IBS (Identical by State) or have a technical issue and we’re not going to deal with that here, because this is a perfect world and we’re only concerned with people whose genealogy we have and that match each other. By this definition, problem matches are automatically eliminated. So let’s look at the 8 people above who don’t match me or the Derrell cousins on Great-Grandma’s/Great-Grandpa’s side, beginning with Bobbi and ending with Isabel. 5. Now we turn to genealogy. We know that these 8 people all share a common ancestral line with Prodigal Great-Grandpa, we just don’t know who that is. Let’s say that of this group, we discover that Bobbi, Harold and Buster are all related to each other, and glory be, they all know who their common ancestor is, or at least the common ancestral line. Let’s say that Bobbi and Buster are first cousins in the Lore line and that Harold matches them closely as well, but he is descended from a Lore ancestor further upstream from Bobbi and Buster. Therefore, we can now say, positively, that Prodigal Great-Grandpa descended somehow from the Lore line. We still don’t know how Sarah, Ronald, Garret, Nina and Isabel connect to Prodigal Great-Grandpa, and that’s OK. We can simply leave them uncolored for now. We can select a color for Bobbi, Harold and Buster and assign then to Prodigal Great-Grandpa who descends from the Lore line. 6. Now it’s time for that luck to kick in. We don’t know that Prodigal Great-Grandpa carried the surname Lore. His mother could have been a Lore, or any of his ancestors. All we have is a common surname and a common ancestor between three people who all match me on the same segment. So, let’s assemble a tree of our cousins to see if we can narrow the scope of maybe who and where and then let’s get busy with the census and other records. Geography is important. Begatting requires proximity and many times, we can find the begatter in the neighborhood. Also, check your genealogy software data base for this surname. You may find the surname in an allied line. Remember, families married their neighbors and often intermarried as well. Sure enough, look there, in our perfect world, we discover that Nora Kirsch is working in her parents inn named the Kirsch House on the Ohio River in 1880. The Kirsch House was also a boarding house, and a restaurant and pub. One of their boarders in 1880 was none other than Benjamin Lore. Hmmm. Surely makes you wonder. Further research on Benjamin Lore shows that he was a wildcat oilfield well driller working in the county where Nora lived and became something of a local legend for discovering the “Blue Lick” water well. Well, now we have a name, proximity and maybe an opportunity. 7. Well, peachy, but what next? Further research on Benjamin Lore shows that he was married in the census, but where was his wife? In previous census records, we find Benjamin Lore in Warren County, PA with his parents. In the Warren County records, we find that he married Mary Bills, and additional research shows in 1880 a Mary Lore with 2 children, but no husband. Court records show they later divorced, with 4 children. Find those children!!! They are the key to confirming the identity of Benjamin Lore as Prodigal Great-Grandpa. 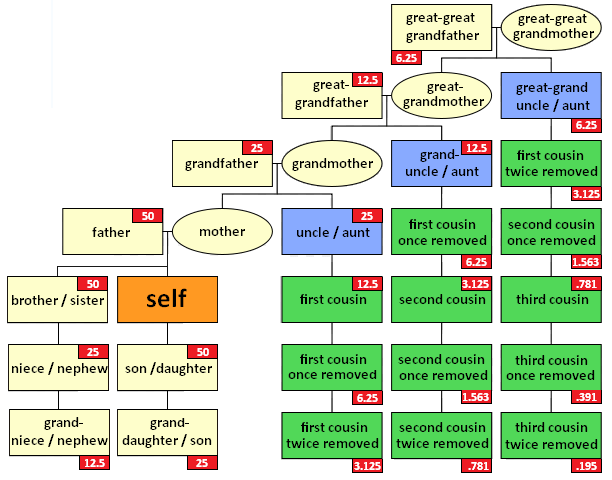 If Benjamin’s other children had children about the same time as grandmother, each line should have 3 generations between Benjamin and the current generation. Benjamin’s great-grandchildren through his first wife would be half-second cousins to me which would be the same as second cousins once removed. They of course would be a generation closer to my mother whose DNA I also happen to have. ISOGG has a wonderful Autosomal DNA Statistics page, and here you can see that second cousins once removed would share about 1.5% of their DNA in what is hopefully a large enough segment to match some of the cousins that have already tested. My mother’s generation, first cousins once removed would share approximately 6.25%. Benjamin’s descendants through his first wife may not match all of my cousins, but they will, hopefully, match some of the descendants of Prodigal Great-Grandpa, confirming, as best we can, that Benjamin Lore was grandmother’s father. The best litmus test of course is how closely they would match the closest generations, like mother or great-aunts/uncles, if they were living. Full Disclosure Note: I used my own ancestors for purposes of illustration, even though Curtis Benjamin Lore (shown at right) was not prodigal in quite the way I portrayed in this article, well, at least not from my family’s perspective. However, he was no saint either and he may well have other descendants looking for him in this exact situation. Aside from what we do know, there is the rumor of an illegitimate son showing up on his widow’s doorstep looking for him, albeit, a little too late. We know that Curtis Benjamin (known as C.B.) 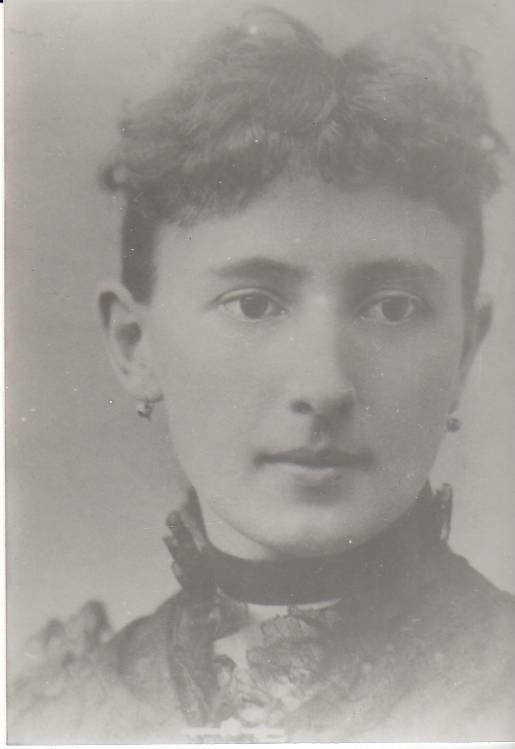 Lore did marry Nora Kirsch in Dearborn County, Indiana, in 1888. These photos are their “wedding photos” but interestingly, there is no photo of them together. 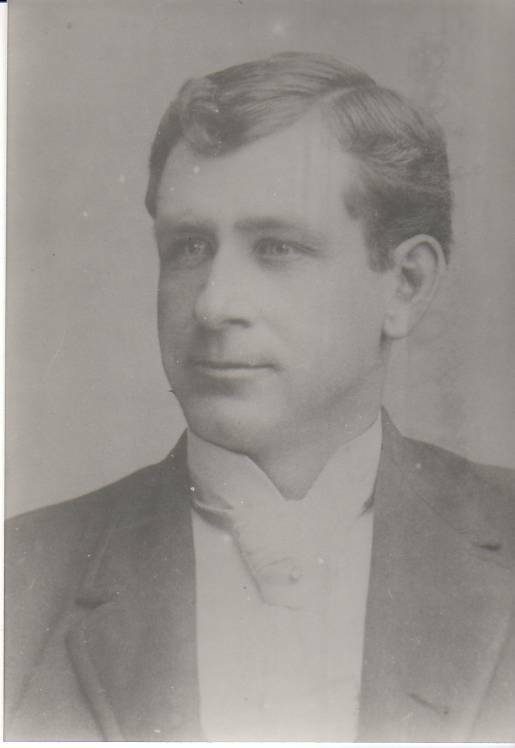 We also know that Curtis Benjamin Lore married Mary Bills in Warren County, PA., had four Lore children, 3 males (Sid, John Curtis and Herbert Judson Lore) and one female (Maud who married a Hendrickson), none of whom we have never been able to find. Also, Curtis Benjamin Lore was not divorced from Mary until, ahem, after he was married to Nora Kirsch when Mary filed for divorce on the grounds of desertion. Apparently, his marriage to Nora Kirsch (pictured at right) fell, literally, according to the secret family story, into the “shotgun” category, so one has to understand that his choice of marriage versus death was fairly defensible. I’m sure Nora’s father, a crusty old Civil War veteran, had no idea that he was already married or Curtis Benjamin would have been on the business end of that shotgun and marriage would not have been a choice. The family took great care that this “uncomfortable” shotgun marriage situation never be discovered, to the point of falsifying the marriage date in the family Bible and also by “adjusting” the birth of the child by a year, also recorded incorrectly in the family Bible. Were it not for the fact that I checked the church records in Dearborn County, I would never have discovered the discrepancy. A child cannot be baptized months before it is born. I might note that it was only AFTER this discovery that my mother was forthcoming with the “family secret” about the shotgun wedding. Birth certificates were not issued at that time and my grandmother’s delayed birth certificate was issued based on the falsified family Bible information. Benjamin probably would not have been bothered by this revelation at all, given what we know about him, but I’m sure Nora’s parents rolled over in their grave once or twice when I made the discovery and now that I’m, ugh, discussing it, and publicly at that. Rogues and handsome scoundrels. They are colorful and interesting aren’t they and provide a great amount of spice for family stories. Hopefully these tools will help you find yours!!! This entry was posted in 23andMe, Ancestor Mapping, Ancestry.com, Autosomal, Chromosome Mapping, DNAGedcom, Endogamy, Family Tree DNA, Tools and tagged Introductory DNA by Roberta Estes. Bookmark the permalink. Great article Roberta, fantastic explanations and examples. Your clear, informative posts are always welcomed! HI Roberta, I downloaded my information from 23andme using dnaged.com. The spreadsheet does not look anything like the one in your diagram. I am not that familiar with spreadsheets but can learn as I go. In the file that was downloaded, my information is spread over three spreadsheets. I also have two files for my mother. The information is not organized by chromosomes. Do I have to arrange the information or must I copy and paste information from these spreadsheets into a DNA match template? The other two files are the AC file which are countries of ancestry which I don’t fine useful, and the other file is a list of all of your matches by name. I refer to that one, but you don’t need to copy anything from it into anything else. Thanks! Your name examples made me laugh. I actually know living sisters name Arlene, Marlene, Darlene, and Charlene. There were triplets with those names where I grew up:) And I really do have three Daryl cousins by different spellings. I had problems with the site tonight too. I would try it again tomorrow. It’s down now altogether. Just so you know, you can download a file directly from Family Tree DNA. On the Chromosome browser page, at the top, there is a link to download the entire file. You don’t have to go through DNAgedcom for FTDNA. I think the dnagedcom site also has a way to download the trees of your matches into a gedcom to use saving you tons of work! I don’t understand how to do this, but hoping someone can help me. I don’t have Excel, but have OpenOffice (which is free). Step by step instructions would be very helpful. Thank you. To do this, you need to understand the very basics of a spreadsheet, like how to sort by column and such. You might find a basics document online or buy a Dummy’s book. That’s what I did a long time ago. Excel (or another spreadsheet) is the fundamental tool for tracking genetic chromosomal data. Yes, and it will work best if you can test your mother to eliminate matches from that side. Also, if you have any relatives from your father’s mother’s line, test them too because that way you can eliminate people who match them. I do appreciate your msgs; research and explanations, elaborations. I manage to read most of them. I’m still frustrated with YDNA and now their new Dec specials. The last time I paid for the MtDNA Family Finder etc. I was assured by a staff member responding to my query that it WOULD indicate which Native American tribes I descended from. There’s some confusion as to whether one Great Grandma was Choctaw or another tribe. One was Cherokee and it would be nice to have verification of that. In any case, the results as far as I could tell, gave no enlightenment at all. Now with the new Dec special offering, I contemplate another level of mother’s side testing and I feel like Charlie Brown with Lucy and the football. I hate spending scarce money for little to no results. Can you or anyone suggest a best course of action for the above goals of ferreting out the Native American tribal ancestry that was through 2 Great grandmothers? You cannot tell which tribe your ancestor was associated with through mtdna testing, unless they happen to match someone who has a known tribal affiliation. Still, that doesn’t mean that is the same tribe your ancestor was a member of, because intermarriage, kidnapping and other relocation types of things happened in Native tribes. The Cherokee and Choctaw were very intermarried. Also, mtDNA will tell you whether your maternal ancestor was Native or not, via the haplogroup assignment, but not the specific tribe. <The presumption here is that if you have 3 people that match on the same segment from the <same ancestor, that’s a confirmed “yes” that this particular DNA segment is descended from that <ancestor. Does that mean 3 people in addition to yourself or 3 including yourself? And could you please elaborate on whether you need 2 or 3 if you're dealing with people who don't share any other known common ancestry, as contrasted with the situation you describe above with 2 matches sharing the same surname and geographic area? You need at least 3 total with the same matching DNA segments, that all match each other, and all have the same known ancestors. Roberta, thanks for the article. I’m in process of trying to do this, but I will need more cousins tested to get very far. What do you do with matching segments below 7 cM? Do you just ditch them entirely, as they are likely to be IBS? Or do you map them if they are part of your match with someone for whom you can map the bigger segments? I’m just thinking it would make it alot easier and cleaner to delete all those short segments from the spreadsheet, but not sure if it would cuase a problem later. I know how to use a spreadsheet, but when you’re looking at thousands of rows of data – well, it would make it easier to be able to pare it down some! I map all of the segments. Thanks – have you found any instances where that smaller match is actually an IBS segment or does it tend to help you identify other matches correctly? So I have another question on the mapping. If I match someone on a certain segment, and they are not a match for my dad at all (big enough match to show for me, showing nothing for him) – then this person MUST be a match to me on my mom’s side, right? OK, wait – I can’t get matching segments at the same place from both grandparents on one side, right? Man, I’m confused! How can these people match me at the same place but not match each other and neither (none) match my dad? Can IBS segments be that long? Is that the tangled southern colonial ancestry making my job harder again? Roberta, thanks. I’m going to have to sit down and make out a list of questions and get together specific examples. The next week or two is going to be kind of crazy, but I do think a quick consult may be in order soon. I don’t want to waste time organizing myself in the wrong direction! This is what I’m looking for! I want to do the mapping for my dad. I’m working on his 2 brothers! I’m hoping we can document Robert Henderson Kilgore (dad’s putative g’grandfather [looking at Eliza and her sister in the census is interesting: two single women and an enlarging circle of children]) … but I really want to know where that 47% Scandinavian comes from. Scots-Irish I new. (27% Irish; 7% Great Britain, but 47% Scandinavian!!) It was a Real Shocker (as the lady on the commercial says). I finally understand thanks to your explanation about chromosome mapping. One of the questions I have is can multiple ancestors (not just half your mom’s side half your dad’s) be on one chromosome? Or will there only be two sets on one chromosome. Half on my mom’s side, half on my dad’s and next trying to figure out which ancestor is on that chromosome? Yes, you can have inherited different pieces of chromosomes from different ancestors. Thank you so much! Perhaps I can now figure out who might have owned my fifth-seventh great grandparents on my dad’s side.